Our product range includes a wide range of hydraulic coining press for coin making. 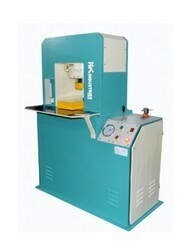 We are offering wide range of Hydraulic Coining Press for Coin Making. Valued for its optimum performance and long durability, this coining press is provided in several specifications as per the needs of clients . Widely used for the manufacture of various types of coins in many minting industries, these products provide accurate outputs with zero faults. Our clients can avail this coining press from us as per their needs at business leading price.